Cooking with fresh products truly makes any dish tastier. I am always trying to find new ways to incorporate local products in my meals, whether that is adding a local vegetable for a side, preparing meat that comes from a area farmer, using eggs from Martha down the road or even indulging in locally made spirits – there is always room on the plate for local food. With fall arriving that leads many consumers back to the stores for all their ingredients, but that doesn’t have to be the case. Just because the summer harvest is complete, doesn’t mean that local produce and other items are tucked away until spring. There’s a wealth of new fall harvest items just waiting to be discovered. Winter squashes, sweet potatoes, pumpkin, broccoli, lettuce and apples are just a few. Don’t be afraid in trying a new vegetable, you never know what new taste you will find. 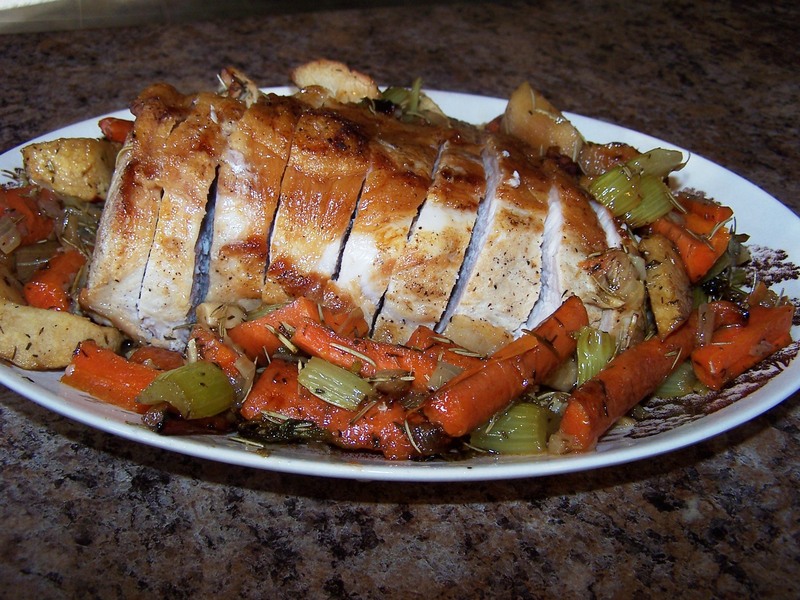 My husband and I decided we wanted to try a new pork loin recipe and upon searching for roasted pork loin and apples I found a number of choices, but decided that the following recipe seemed simple enough, but tasty. And, I was correct. The sauce that the juices and reduced apple cider create is amazing. I used 4 apples instead of the 2 that the recipe calls for. Even our toddler gobbled up this dinner. I hope your family it enjoys this meal as much as mine did…it’s a keeper. In a large ovenproof skillet heat the vegetable oil over high heat. Season the pork loin all over generously with salt and pepper. Sear the meat until golden brown on all sides, about 2 to 3 minutes per side. Transfer the meat to a plate and set it aside. Transfer the pork a cutting board and cover it loosely with foil while you make the sauce. Arrange the apples and vegetables on a serving platter and set aside. Remove and discard the herb sprigs. Return the skillet to a high heat and add the vinegar scraping the bottom with a wooden spoon to loosen up any browned bits. Reduce by half then add the cider and reduce by about half again. Pull the skillet from the heat and whisk in the mustard, and the remaining 2 tablespoons of cold butter. Adjust the seasoning with salt and pepper, to taste. Remove the strings from the roast and slice into 1/2-inch thick pieces and arrange over the apple mixture. Drizzle some sauce over meat and serve the rest on the side. Interested in an easy kabob recipe…I’ve got your covered with my Market Style Kabob Cooking Video from the Marshfield Farmers Market. Looking for an easy kabob recipe incorporating fresh products from the farmers market – The Market Lady has you covered! Here is our video from the Marshfield Farmers Market visit. 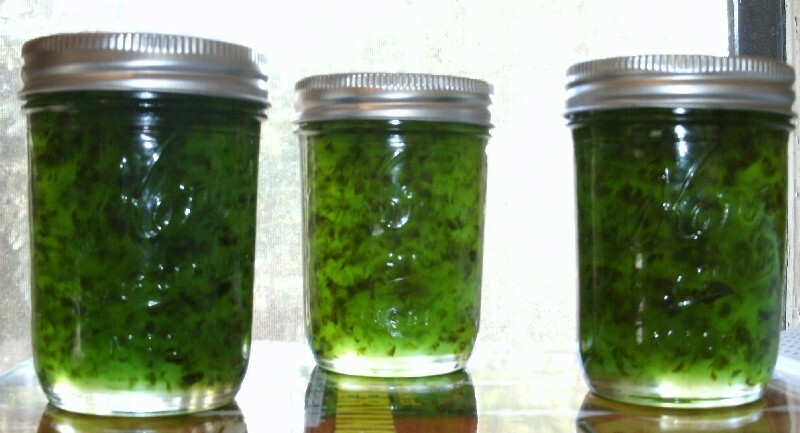 My mother and I make Jalapeno Pepper Jelly every year to give to friends during the holidays. Straight out of our garden we pick peppers and prepare the kitchen for jelly making. This takes quite a bit of time, but is worth the wait. You can find the recipe we use here. Most folks only know one way to consume this delicate and spicy jelly- with cream cheese and crackers. Yes, that is one of my favorite ways as well, but there are a lot of other options to be aware of. Such as using the jelly as a marinade or basting sauce for pork and chicken. Pepper Jelly is perfect with grilled meat – give it a whirl this weekend. You can find many local farmers selling Pepper Jelly at area markets, made from peppers from their own gardens. Ask your farmers what their favorite way to use Pepper Jelly is- I bet they can provide a wealth of knowledge. Here is one of my mother’s favorite recipes that uses her homemade jelly as a baste. Seed and chop tomatoes and cut zucchini into 1/2-inch pieces. Finely chop coriander. In a heavy skillet cook onion in oil over moderately low heat, stirring, until softened. Add tomatoes, zucchini, garlic, corn, and salt and pepper to taste and simmer, covered, stirring occasionally, until zucchini is tender, 25 to 30 minutes. While corn mixture is simmering, prepare chicken. In a small saucepan melt jelly over moderate heat, stirring, and remove pan from heat. Stir in lemon juice and chili powder and divide jelly mixture between 2 small bowls (to prevent the potential contamination caused by uncooked meat juices). Pat chicken dry and brush with jelly mixture from 1 bowl. Season chicken with salt and grill on an oiled rack set 5 to 6 inches over glowing coals until just cooked through, about 4 minutes on each side. With a clean brush, coat chicken with jelly mixture from other bowl. Stir cream cheese into corn mixture until melted and stir in coriander and salt and pepper to taste. Serve corn mixture topped with chicken. Here is my mother’s recipe for a hearty farm fresh breakfast. I make this Ozarks Breakfast Casserole at least twice a month for my family. Feel free to add other vegetables to it and you can take out the pork sausage if you don’t have any on hand. 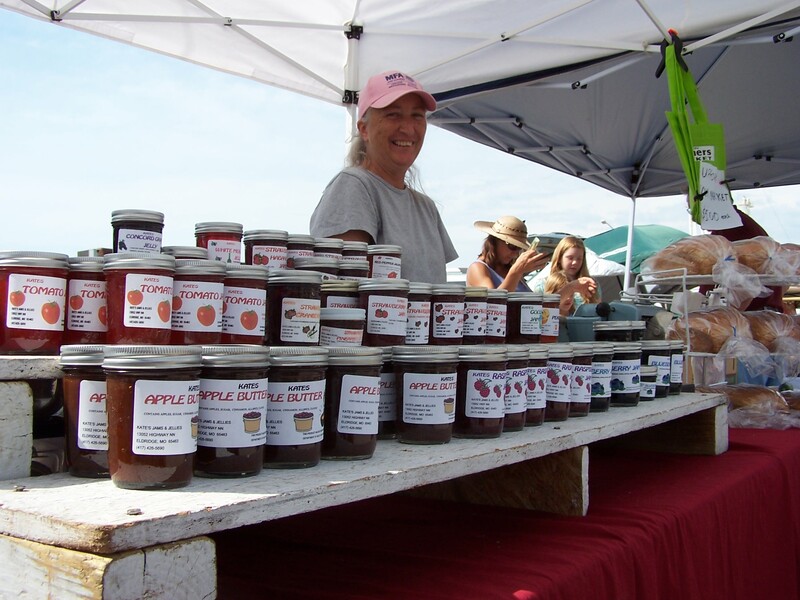 The Market Lady, Lane McConnell, will visit the Aurora Farmers Market in Aurora, Mo., Wednesday, June 29. The Market Lady and video crew will begin at 8 a.m., with one cooking demonstration incorporating products from the market and will be interviewing producers and consumers for various other segments. The purpose of The Market Lady Project is to educate consumers about eating healthy, locally produced food found at their farmers market. Below is the recipe that The Market Lady will be preparing at the market. Be sure and come out to the Aurora Farmers Market on June 29 to meet the Market Lady and video producer and Aurora native Kelsie Young. 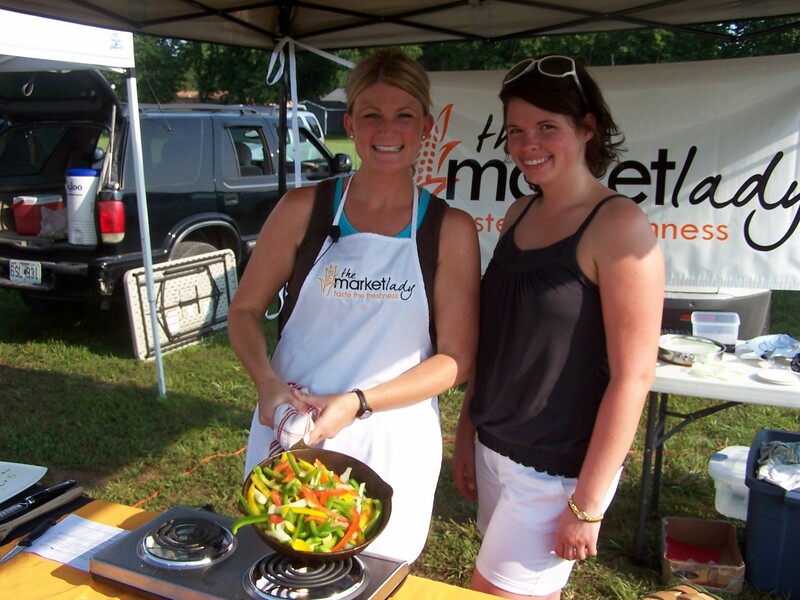 We grilled up some fajitas at the Greater Polk County Farmers Market recently and they were a hit with the crowd and vendors! A vendor that raised Belgian Blue cattle provided fajita meat that was lean and already thinly sliced that was perfect for fajitas. Goes to show…never know what you will find at the market. The term Fajitas refers to any grilled meat that is served on a flour or corn tortilla and also goes back to the cut of beef used in making this dish. Typically you will see skirt steak used when making fajitas, but don’t be afraid to use shrimp, pork or even chicken. Now, I just used prepared meat, but you can season your own skirt steak with a simple marinade and letting your steak sit at room temperature for about an hour, or longer in the refrigerator. Be sure and wipe the marinade off the meat, before you cook it. Heat up a large cast iron skillet and add a couple tablespoons of oil to the pan. Add the steak, frying on each side for 2-3 minutes or medium rare. You want the meat to be browned, but not burned. When the meat is done, remove from skillet and let rest. Resting allows the meat to redistribute the juice throughout. Next, cook the vegetables in the same skillet while the meat is resting. Add a little more oil to the pan if necessary, then add the onions and bell peppers. Let these sear for 1 minute before stirring, then stir so as the veggies sear. Cook for about 5 minutes. Slice the meat against the grain into thin slices. If you slice the meat at an angle, you will be able to get your slices pretty thin. These cuts of steak are flavorful but can be a little tough, so thin slices will really help make it easier to eat. Popular condiments are shredded lettuce, sour cream, guacamole, salsa, pico de gallo, cheese, and tomato. We were lucky enough to have freshly made flour tortillas and homemade blueberry banana bread supplied by The Berry Patch from Bolivar, Mo. Thanks to all the vendors that supplied products for our cooking demos. 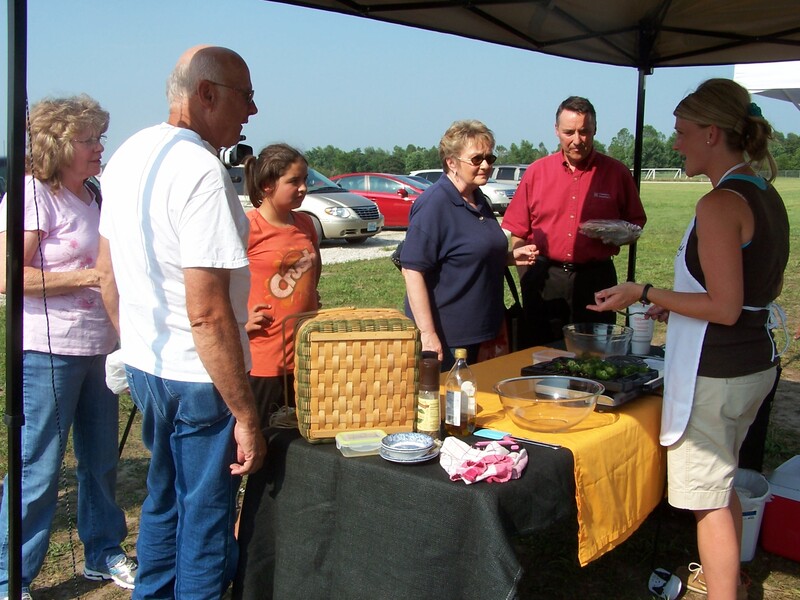 Lots of folks showed up to ask questions and sample the fresh food we prepared. A great community with a strong market presence. 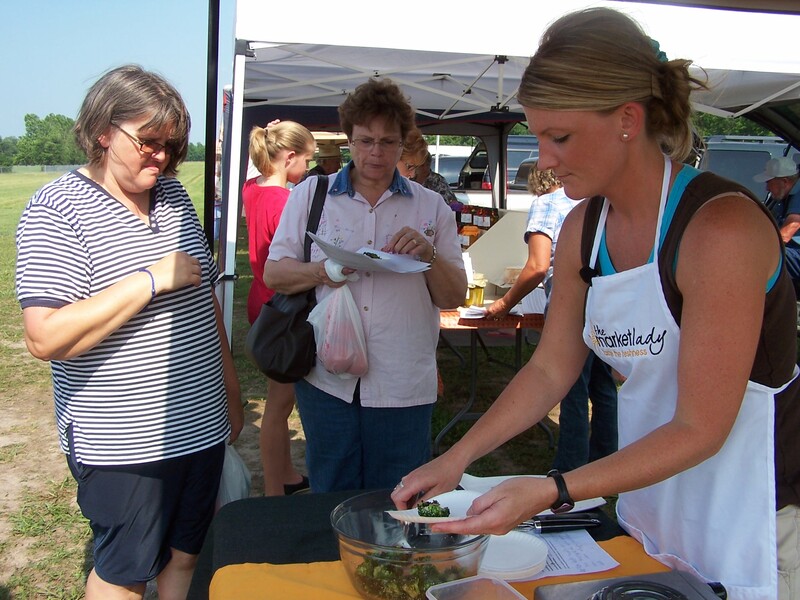 The farmers market offers an array of tastes and colors that will make every dish special.